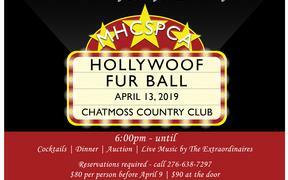 Join the SPCA for our 7th Annual FurBall on April 13th at Chatmoss Country Club. Reservations open on Valentine's Day (February 14th). Space is limited! Tickets are $80 per person as long as you pay before April 9th (the reservation cut-off date). This ticket includes a night of live music by The Extraordinaires, dancing, buffet-style dinner, and an open bar. With our theme of Hollywoof Nights, we encourage everyone to dress in their best Hollywood glam inspired by their favorite stars across the ages. Cocktail attire or costume optional. This Gala will feature both live and silent auction items, along with raffle sales leading up to and during the event. You could be entered to win a week getaway to St. Thomas, a diamond necklace with an assigned value of over $5,000, or a Community Basket full of goodies from local restaurants, entertainment, and stores. 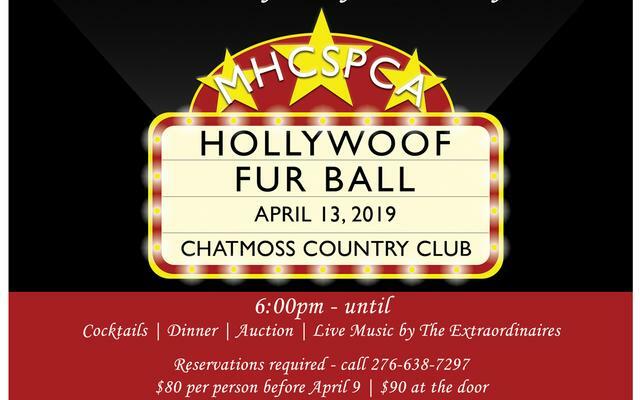 All proceeds go to our spay and neuter program which allows for us to not only alter our shelter pets, but also to provide assistance to our community for their personal pets. You do not want to miss this!